Danny Ford was a very popular Clemson head football coach who oversaw Clemson's only National Championship season in 1981. He sprang to national prominence when he took over the reins of Charlie Pell's 1978 Clemson team after Pell took another coaching job after the regular season, and led the Tigers to a 17-15 1978 Gator Bowl win over the Ohio State Buckeyes led by legendary Big 10 Coach Woody Hayes in what turned out to be his last game. In his eleven seasons at the helm of the Tiger gridiron program between 1979 and 1989, Ford racked up a 96-29-4 record and is one of only two coaches in ACC history with over a 75 percent average (minimum four years). Coach Ford was born on April 2, 1948 in Gadsden, Alabama. A 1969 graduate of the University of Alabama, Ford attended 'Bama initially on a basketball/football scholarship, but played only football after his freshman year. He was an All-SEC selection as well as an All-SEC Academic choice at Alabama. Ford played in three bowl games as a member of the Crimson Tide under legendary Coach Paul William "Bear" Bryant. Ford was an assistant coach at Virginia Tech before coming to Clemson. He served in the same capacity in 1978 under Head Coach Charlie Pell as the Tiger team racked up a successful 10-1 regular season record. After Clemson accepted a berth in the 34th annual Gator Bowl following a 28-24 win over Maryland in College Park on November 18 (the most-evenly matched and BEST game this reporter ever saw), (see 1978 Clemson-Maryland football game), Pell directed the Tigers to a 41-23 vanquishing of the USC Gamecocks in Death Valley on November 25. With the win over Maryland, the Tigers clinched their first ACC championship since 1967. The Orange loyal looked forward to a well-earned post-season game. So it came as quite a shock when Pell announced on December 4 that he was accepting the head coaching position at the University of Florida in Gainesville. As the word spread on campus around suppertime that Pell had defected, the "Give 'Em Hell, Pell!" signs were almost instantly converted to or were replaced by "Go to Hell, Pell!" placards. On his way out the door, Pell offered to coach the bowl game, anyway. His generous offer was declined. On December 5, Danny Ford was announced as the new head coach. On December 10 it was confirmed that he, not Pell, would lead the Tigers in the upcoming Gator Bowl in Jacksonville, Florida. It did not conform to ANY Ohio State gameplan. The first quarter was scoreless, with the Tigers twice holding the Buckeyes on fourth down plays, including one stop on the 1-yardline. In the second quarter, the Buckeyes got the first points when Bob Atha made a 27-yard field goal. Clemson quarterback Steve Fuller then ran the ball in on a four yard left-end sweep after an 80-yard, 15-play drive with Obed Ariri completing the point after, Clemson leading, 7-3. Ohio State quarterback Art Schlichter responded nine plays and 78 yards later for six points when he ran the ball in on a 4-yard quarterback-keeper, but Clemson blocked the kick - OSU leading, 9-7. Clemson regained possession with 1:15 remaining in the half and Fuller passed his way to the Buckeye 30-yard line. With five seconds on the clock, Ariri booted a 47-yard fieldgoal, giving the Tigers a 10-9 halftime lead. In the third quarter, Clemson's ground game crunched its way upfield (19 plays, 84 yards) for the only score of the quarter when freshman tailback Cliff Austin reached the endzone on a 1-yard run plus PAT, putting Clemson up by 17-9. In the fourth quarter, Clemson gridiron history was made. With 8:11 left in the game, Schlichter scored his second touchdown after a 12-play, 87-yard drive to bring the Ohio faithful within two points, but outstanding Clemson defensive end Jim Stuckey dragged down the quarterback on a two-point conversion attempt; Clemson lead, 17-15. Ohio State got one more shot with a final drive when Fuller fumbled the pitch-out on the OSU 36 yardline. On a third-and-five at the Clemson 24, Charlie Bauman, a second-team nose guard, intercepted the pass by Schlichter and ran it out of bounds, whereupon an enraged Woody Hayes took an ineffectual swing at the student athlete for ruining his play - in front of God and everybody on national television. Consecutive unsportsmanlike conduct penalties gave Clemson excellent field position, and Fuller was able to run out the clock for the Tiger's first Big Ten victory. Woody Hayes' retirement from college coaching was announced the following morning after the Board of Trustees met. At the time of the broadcast, ABC had only paid for cheap telecast equipment for a second-tier bowl and did not have replay availability. So, out the outset, only those television viewers who were watching the play unfold actually saw Bauman encroaching on the Buckeye bench, shoved by OSU linemen, and the quick single swing that Hayes laid across Bauman's shoulder, followed instantly by other jostling players crowding into the frame. In the stadium, initially, the only thing known for sure was that something had occurred that emptied both benches. Word circulated quickly as to what had happened. "With 1:59 remaining in the game and the career, Woody Hayes's contradictions finally synthesized. Behind, 17-15, Schlichter led his team downfield. On a third and five from the Clemson 24, he underthrew halfback Ron Springs, and Charlie Bauman intercepted the first pass of his life. The Buckeyes drove Bauman out of bounds in front of Hayes. Woody slugged the player under the chin. In that impulsively violent moment, the puzzle of Wayne Woodrow Hayes, that enigma cloaked in a mystery, forever crystallized, and he froze in time as mastermind, megalomaniac, and martyr. The final image is a strange Laocoön grouping: Three figures-Hayes, Bauman, and another Clemson player trying to intervene-linked by a serpent of flailing arms. It was an act, like Achilles' destruction of the Trojan youths, that couldn't go unpunished, despite the hero's past deeds." - Natali, Alan, "Woody's Boys: 20 Famous Buckeyes Talk Amongst Themselves", Orange Frazier Press, Wilmington, Ohio, 1995, ISBN 1-882203-04-6, pages 46-47. "He supposedly once said that he preferred to die on the 50-yard line at Ohio Stadium in front of the usual crowd of 87,000, a romantic ending for the legend. At 60, he told (writer) Robert Vare he'd know when the time had come and would have sense enough to get up and walk out the door. He said that his record spoke for itself and only the players could fire him. Everyone associated with him knew he'd fought too long and too hard to go gently into any good night. Lombardi died. Frank Howard became infirm. Paul Brown and George Halas slipped upstairs to management. Bear Bryant was ornery enough to say it'd all been a big joke and stroll off chuckling to raise hogs. But they were going to have to kill Woody, or chase him away. He couldn't, as the ancient Macedonians did, simply purge himself of battle lust by cutting a dog in two and marching between its parts while praying to the gods of peace and the hearth." - Natali, page 45. 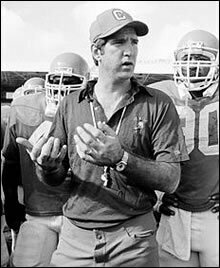 With the 1978 Gator Bowl victory at age 30, Danny Ford was both the youngest NCAA Division I college head coach, and the only one whose record consisted of a single bowl win. He did not disappoint the Tiger faithful in 1979, gaining a 12-7 win over Georgia and a 16-10 victory over Notre Dame in South Bend in an 8-4 season and earning the Tigers a trip to the Peach Bowl in Atlanta on New Years Eve. After a lack-luster 1980 season, the Tigers rebound in 1981 with only their third undefeated season since 1900 (the other being 1948), going 11-0 in the regular season and defeating the Nebraska Cornhuskers, 22-15, in the Orange Bowl in Miami, Florida on January 1, 1982 to clinch Clemson's first National Championship for a 12-0 record. Ford was named national coach of the year. In the 1982 and 1983 seasons Clemson achieved twin 9-1-1 records, despite having been put on two years' NCAA probation, and three years' ACC probation for recruiting infractions committed by Boosters as well as two assistant coaches from 1977-1981, primarily in the recruiting of two players who never played football for Clemson. The NCAA report names Ford only twice, and neither were for major violations. The Tigers finished in the top twelve in both seasons, and thus had a 30-2-2 record over a three year period, the best in the nation. Ford's .760 winning percentage remains the third highest in Clemson football history. Ford secured three straight ACC titles betweeen 1986 and 1988. In 1989 he brought the Tigers a 10-2 record and a top twelve ranking, the fourth straight season that Clemson had finished in the Associated Press top twenty. New university President Max Lennon took a different view of collegiate sports dormitories and training facilities in light of new NCAA athletic rulings than did Coach Ford. In what is possibly THE power struggle demonstrated at Clemson between the forces of academia and sports, Danny Ford came out on the losing end of the power stick and resigned on January 18, 1990. His position was not strengthened by a series of team member scrapes with the law. Ford went onto the head coaching job at the University of Arkansas from 1994 to 1997. He owns a 137-acre farm estate in Pendleton, South Carolina. Clemson announced that they were hiring Arkansas Coach Ken Hatfield as Danny Ford's replacement, much to the vocal dismay of many Tiger fans. Legendary Coach Frank Howard made a personal appearance at Death Valley to answer and assuage irate Tiger fans' complaints about Danny Ford's dismissal. In other towns, the mood could have easily turned into civil disobedience. Although Ken Hatfield would achieve a 32-13-1 record over his four years as the Clemson head coach, 1990-1993, he would remain tainted as the guy who tried to replace Danny Ford, a thankless task comparable to the forgotten coach who took over for Paul "Bear" Bryant at Alabama. Three Clemson players are riding in a car. Who's driving? "I want to coach a team that opponents don't look forward to playing." This page was last modified on 16 December 2009, at 04:23.